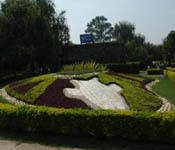 Chandigarh, awell planned city of India is located at foothills of Shivalik Range. 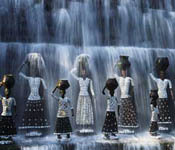 It is famous for its museums, gardens and architecture. 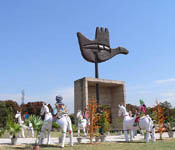 Chandigarh is the joint capital of Haryana and Punjab state and has a total area of 114 sq km. The modern city stands as a symbol of architecture creativity of few selected geniuses who made it possible to develop a well planned city from agriculture fields. Chandigarh city is the hall mark of dedication, team work, innovation and skill displayed by a team led by French architect Le Corbusier. The city consists of forty seven sectors and each sector is an independent dwelling unit with shopping area, hospitals, schools and other amenities. These sectors are connected by well maintained road. The beauty of the place lies in the even growth of trees on the road side, excellent buildings and parks. Sukhna Lake which is manmadeis the only lake available in Chandigarh city. This three km lake which is located in the foothills of Shivalik hills is fast emerging as popular destination for people within the city and tourists visiting the city. It has been constructed by restricting the flow of Sukhna Choe stream. It is a favorite spot for morning walk to enjoy the cool breeze amidst nature at its best for people of Chandigarh. Facilities for boating, water skiing and yachting have been provided in this beautiful lake. The availability of excellent facilities for water sports makes this lake an ideal place for Asian level Rowing Championships. Chandigarh city has been planned to provide pollution less environment. The rich source of flora and fauna and the presence of abundant area under the forest make this city excellent place to live. The city houses two natural forest reserves (Kansal and Nepli) which are the dwelling places for numerous wild animals. The availability of natural landscape and abundant forest area makes an ideal resting place for the animals. Tourists can visit these places by obtaining prior permission from forest departments and make use of the facilities and rest houses available in the nearby forest department offices. The main architectural symphony of city is the Capitol Complex. The overall credit for construction of this excellent structure goes to Le Corbusier, who was also responsible for making Chandigarh the dream destination of many. Chandigarh’s important administrative wings the High Court, Secretariat and Legislative Assembly are located in Capitol Complex. These buildings are the headquarters for both state governments (Haryana and Punjab). These three structures represent pillars of democratic system of the country. The construction of these structures follows a twofold cover, which resembles an overturned umbrella. These magnificent structuresdisplay immaculate talent of the architect which attracts many tourists.